With Man City not in action until Monday, Liverpool moved back to 7 points clear at the top of the Premier League this past weekend, overcoming Brighton 1-0 thanks to a Muhammad Salah penalty. For Arsenal, they lost their 5th game of the season as they were out spotted 1-0 by West Ham. Declan Rice scored the only goal of the game after he was set-up by former Gunners midfielder, Samir Nasri. Elsewhere, Watford, Everton, Southampton and Burnely also registered wins over Crystal Palace, Bournemouth, Leicester and Fulham respectively. GK: Davis De Gea (Man United). 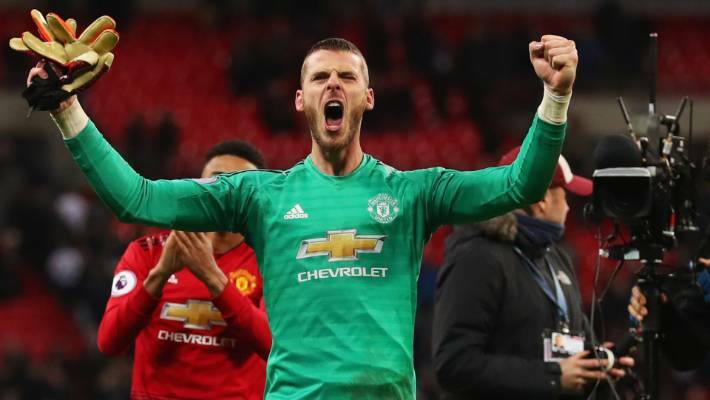 David de Gea made 11 saves in the win over Spurs – only against Arsenal in December 2017 has he made more in a Premier League match (14). This was also the highest number of saves he has made in a league game while also keeping a clean sheet. Ten man Southampton exhibited a great deal of resilience to defeat Liecester 2-1 on Saturday. None of the players stood out for me like Bednarek especially after that miraculous goal-line clearance that virtually won the game for Rulf Hussenhutle’s side. As well as providing a fantastic assist for Pedro’s opener for Chelsea, David Luiz made six clearances, two tackles and two interceptions in the Blues’ 2-1 victory over Newcastle. After an erratic start to life at Liverpool, Fabinho is slowly growing into an important player for the Reds. Against Brighton, he produced another breath-taking performance at center-half. Digne has been one of the stand-out performers of the last few weeks. On Sunday, he provided the assist that saw off Bournemouth at Goodison Park. His team may have lost 1-0 to Man United but Winks continues to prove he is the future for Spurs. He dominated a midfield full of seasoned performers like Pogba, Matic and Herrera, for the best part of the game. MF: Declan Rice (West Ham United). Declan Rice became the 10th teenager to score a Premier League goal for West Ham, and the first since Junior Stanislas in November 2009. The goal came in the 1-0 defeat of Arsenal on Saturday. Pedro has now scored three goals in his two Premier League starts against Newcastle at Stamford Bridge – against no other side in the competiton has the Spaniard netted more goals for Chelsea (3, level with Bournemouth). FW: Marcus Rashford (Man United). Man Utd’s Marcus Rashford has scored in three consecutive Premier League games for the first time in his career. Scored the winner on Sunday as United defeated Spurs 1-0. André Schürrle’s opener against Burnley (01:49) is the quickest goal by a Fulham player in the Premier League since Clint Dempsey scored netted against Norwich City back in March 2012 (01:46). Long won a penalty and scored the winner as Southampton defeated Leicester 2-1 on Saturday.